The Mini Press II with sense force instrumentation is an ideal machine for educational institutes, R & D and small batch production. 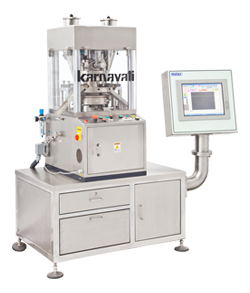 This small and sturdy single sided rotary tablet press is designed with GMP considerations. The machine runs at low noise level. The speed is controlled via an ACVF drive and is easy to operate, maintain and clean. All controls for setting tablet parameters are on the dash board. The Sense Force Instrumentation Monitoring System is engineered to integrate hardware and software into a complete data acquisition and analysis system. SFIMS is a state-of-the-art tool that facilitates research, process development, scale-up and production of tablets. It is Windows based and provides continuous batch recordings and process optimization for all instrumented equipment. The system is modular and is contained in a mobile enclosure that can be moved between different types of instrumented equipment. Each system can be custom tailored to match customer specific needs. Optimize the level of lubricant, diluents and other recipients in tablet formulations. Develop prototype formulations and formulation “fingerprints” for international use. Use press instrumentation and monitoring system on a daily basis for press troubleshooting such as improper press settings, punch and die wear or damage, punch length variation. Use the system for continuous batch record of clinical and production runs with full statistical process control. 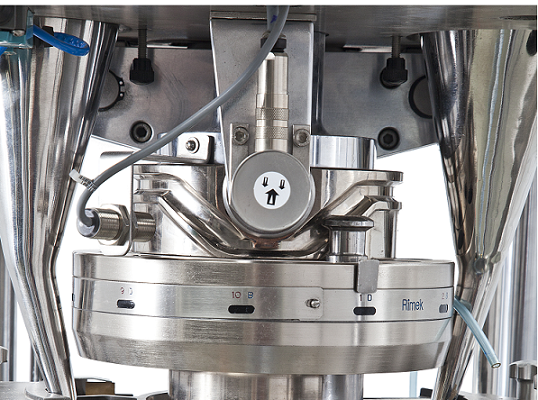 The TABLET PRESS MODULE (TPM) can monitor upper compression, upper pre-compression and ejection forces. TPM provides real time force meters which help in per punch statistics, streamline compatibility profiles, dissolution and disintegration cross-correlations, raw materials evaluation, quality control, and press troubleshooting. TPM reports provide punch forces and contact and dwell times. 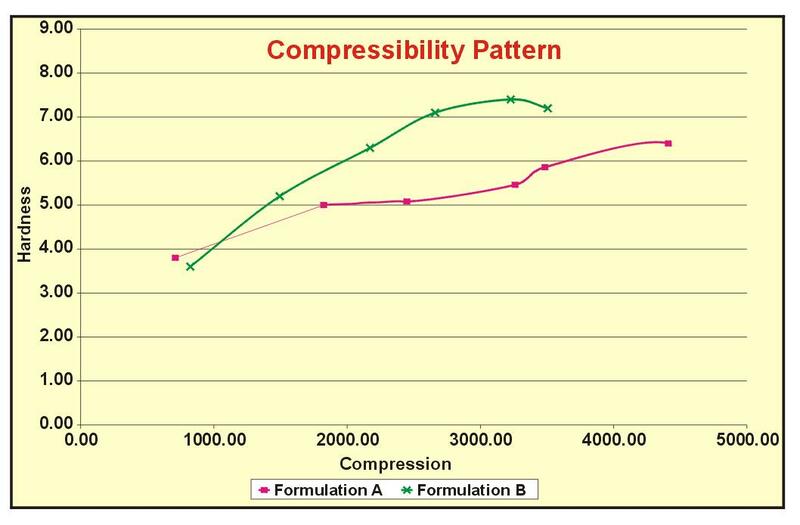 When the average tablet hardness is plotted against the average compression peak force, we get the so-called compression profile that allows us to compare different formulations or different processing speeds. On the screen, which formulation is better? 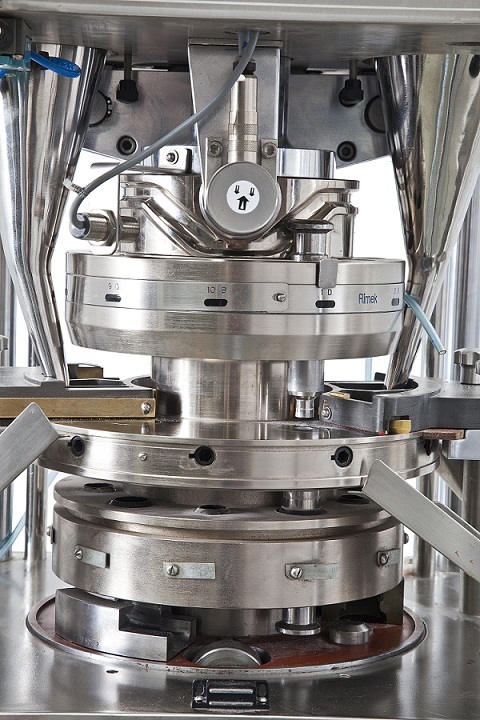 Well, Formulation B makes harder tablets for the same compression force, and this would mean less wear and tear on the production press is required to achieve desired hardness. On the other hand, if your hardness tolerance limits are exceptionally narrow, the steeper slope of Formulation B may be a detriment.